When your home needs a new roof or roof repair in the Pinckney Michigan area there are many choices for a roofing contractor. However, not all of them can offer the service, pricing, and overall advantages that Livingston Roof Pros offers. Our team of roofing experts can install a new roof on your home or do roof repairs at a competitive price. We’ll also stand behind every project we complete. We are one of the top roofing contractors in Pinckney MI and we’d love to show you why we think we’re better and you should choose us for your next roofing project. 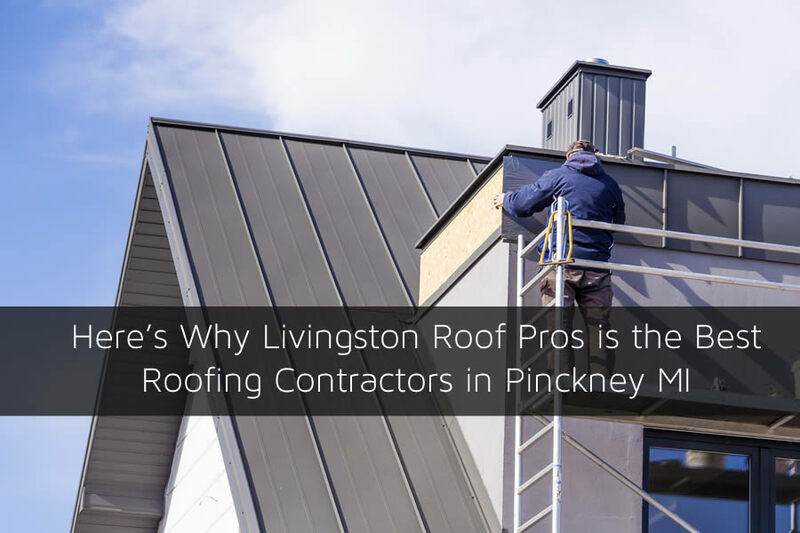 Included in this article are some of the reasons why choosing Livingston Roof Pros is your best choice for roofing contractors in Pinckney Michigan. When choosing a roofing contractor in Pinckney Michigan or anywhere else you’ll certainly need to look for certain things. One of the very first things you’ll want to consider is whether the roofing company or contractor is actually licensed to work on your home. Having an unlicensed person doing repairs on your home can cost you loads if something goes wrong. At Livingston Roof Pros we are fully licensed and employ roofing experts with decades of experience. In fact, most of our team has been with us the entire time we’ve been in business. There are so many things that have changed in roofing over the past 20 years. From the popularity of metal roofing in recent years to newer, more eco-friendly shingles that are now available, having someone who knows about current roofing technologies and systems can give you a much better outcome to your home’s roofing project. Our team of roofing experts have been in the roofing industry for decades and have seen many different roofing configurations and systems. We’re fully qualified for any project we take on no matter how new or old the materials are. We take pride in the work that we provide and we make sure that when it comes to roofing on your home, we’ll have experienced roofing technicians there to help. We’ve been in business for a long time and the reason is simple: We are the top roofing contractor in Pinckney Michigan for customer service. We want each and everyone of our customers to feel like they got more than they could get from any other roofing contractor in the area. We go the extra mile to make sure you’re completely satisfied with any of the work we’ve done. And if there is a problem, please let us know and we’ll do everything we possibly can to make it right. We’re dedicated to customer service because we believe that’s how business should be done. And if you don’t need us today, we’ll be here tomorrow. As I mentioned above there are many new roofing systems that are being installed today. At Livingston Roof Pros we can install almost any type of roofing material that is available today on your home. From the latest in asphalt shingle roofing to the newest metal roofing offered, we can cover your home and make it look amazing. Also we’re properly qualified by manufacturers on any of the roofing materials we install on your home. Don’t let someone experiment on your home with a new roofing system, use the experts at Livingston Roof Pros to get the roofing on your home correctly installed. Need to save some money on your roofing installation? At Livingston Roof Pros we offer several different roofing methods that can save you money on a new roof installation. We offer re-roofing on homes that qualify and offer a very economical way to get a new roof in Pinckney Michigan. If you’re ready to get started on a new roof project or roof repair, be sure to contact Livingston Roof Pros and get a price on the project before we begin. We can offer a free estimate on roof repairs and new roof installation in Pinckney Michigan. Plus, we can answer any questions you may have about your roofing project in Pinckney Michigan.